A few boats out today, a few were commercial King Mackerel fishing, both trolling and live bait fishing. 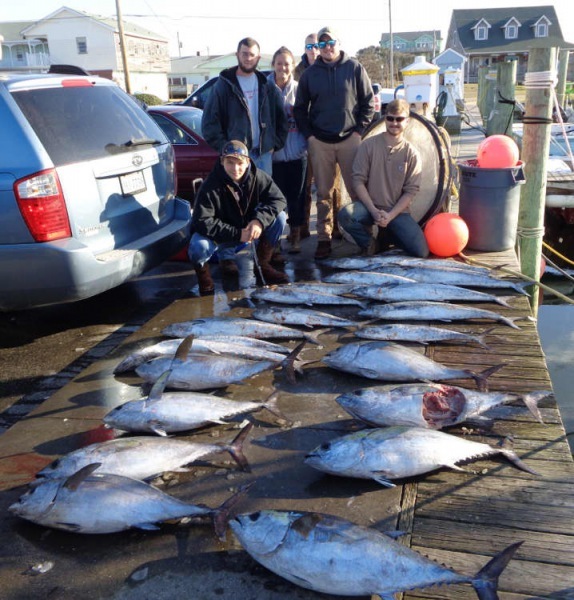 They reported great catches of Kings as well as some Blackfin Tuna. One boat had a charter and they had a great day catching citation size Blackfins and BIG Sharks that were released. We had one charter head offshore this morning and they returned with a good catch of Triggerfish. They released a Tiger shark as well as numerous Amberjack. 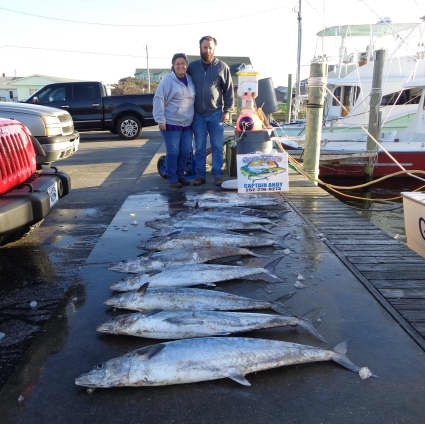 Commercial fisherman returned with King Mackerel and a fair catch of Blackfin Tuna. The weather is supposed to warm up beginning the first of the week and hopefully anglers will want to get out to the Gulf Stream to see what's biting! Dawson Bowden of Virginia Beach, VA: 80" Tiger Shark release on Good Times. 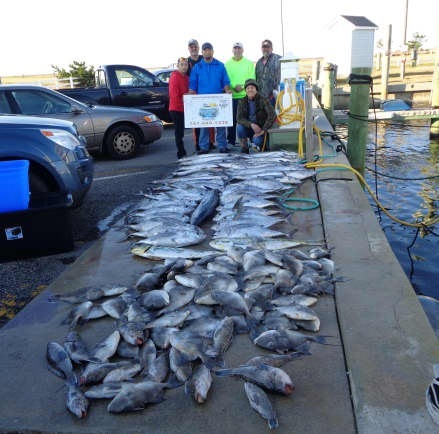 Despite a northwest wind and very cold conditions, several boats fished offshore. Fishing was pretty scrappy with some Blackfin Tuna, one Dolphin, and some King Mackerel being caught. 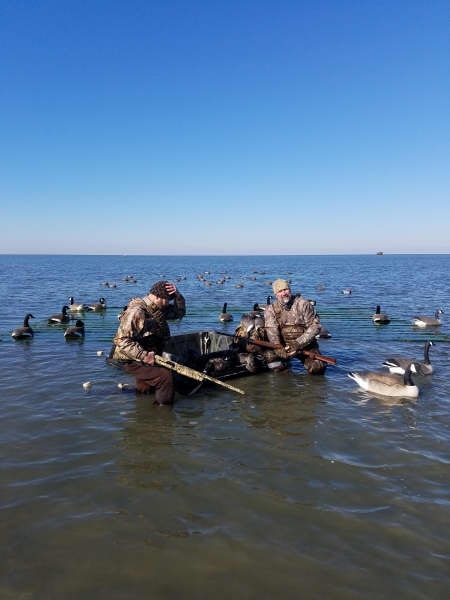 It was the official start of Duck season today and several groups went out into the Pamlico Sound and reported limits of Pintails, Brant Geese, and Redheads. Wondering what to do on these short days? Get out onto the water to fish or hunt, just give us a call at 800-676-4939 and book your adventure today! A strong west wind blew in last night bringing cold conditions and big seas. No one fished today. The weather is supposed to warm up by the weekend. Interested in fishing? Give us a call at 800-676-4939 and we'll hook you up. Monday Offshore boats had a great catch of King Mackerel while Inshore boats kept in. Tuesday was quiet with boats at the dock and a fair breeze coming in. Weather was still cold today but at least the rain cleared off. Hatteras Village had their annual Christmas parade today and a lot of fun was had by all. We hope you made it down and enjoyed it and maybe got a handful of candy! Nothing to report on the fishing front today. The holidays are on us and we have great gifts for everyone on your list! Boats fished Inshore and Offshore today. Weather was much colder and rain drizzled for most of the day. Offshore boats caught decent King Mackerel and a few Albacore. Inshore boats were finding Puppy Drum in good numbers. 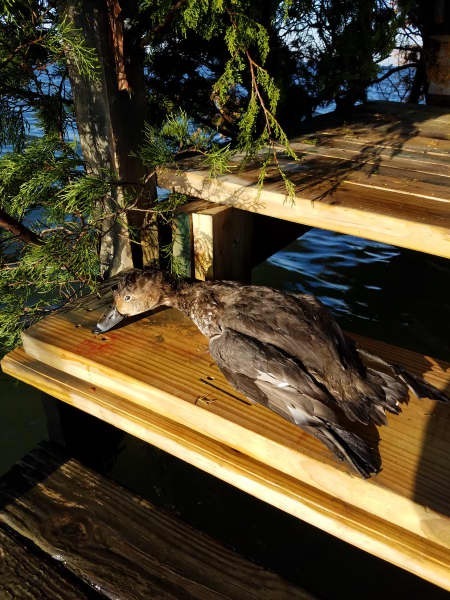 Duck season reopens December 16th our guides will get you out and set you up for a day of hunting! Michael Evans of Statesville, NC: Shark release on Carolina Girl. No boats fished today as there were no charters. Rain moved in this afternoon and will continue throughout the rest of the week. Check back to see what's going on. 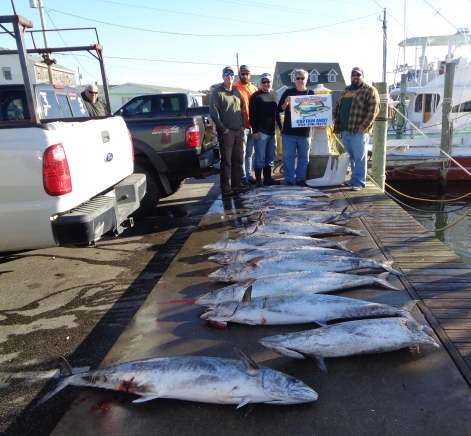 We had one offshore charter to head out this morning and they returned early with almost 650 lb. of King Mackerel, so the bite is picking up! It looks like tomorrow is going to be another pretty day for fishing before a front moves through bringing rain and possibly some snow as it turns colder towards the end of the week. Andrew Mooney of Chesapeake, VA: 45 lb. King Mackerel on Good Times. Jon Teig of Portsmouth, VA: 50 lb. King Mackerel on Good Times. Christian Basnight of Chesapeake, VA: 54 lb. King Mackerel on Good Times. Joel Macdonald of Chesapeake, VA: 51 lb. King Mackerel on Good Times. Jon Herlong of Gloucester, VA: 49 lb. King Mackerel on Good Times. Winds turned north today bringing much cooler temperatures. Several charters fished offshore and had a good day catching King Mackerel (live baiting and trolling). One charter departed yesterday and stayed out overnight. They returned ( needless to say a bit tired!) 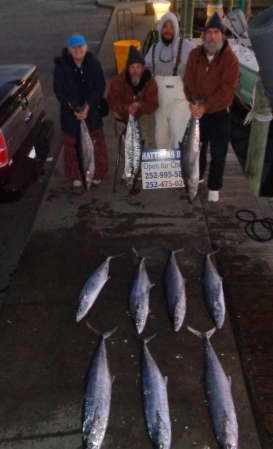 with a limit of King Mackerel, a nice catch of Blackfin Tuna, a Dolphin, a Wahoo, Triggerfish, and Black Sea Bass. Commercial fishing produced a pretty good catch of King Mackerel. We'll have to see what the rest of the week brings (weather wise and fish wise). Kelsey Hicks of Statesville, NC: 21 lb. Blackfin Tuna on Adventure. Ian Nolan of Statesville, NC: 42 lb. King Mackerel on Adventure. Brandon Washam of Statesville, NC: 42 lb. King Mackerel on Adventure. Tim Brown of Zuni, VA: 4 Shark releases and 37 lb. King Mackerel on Carolina Girl. John Kim of Sykesville,, MD: Shark release, 20 lb. Blackfin Tuna, and 32 lb. King Mackerel on Carolina Girl. David Xie of Chesapeake, VA: 35 lb. King Mackerel, 2 Shark releases, and 23 lb. Blackfin Tuna on Carolina Girl. Jack Cheeks of Elizabeth City, NC: 43 lb. King Mackerel and 7 lb. Triggerfish on Carolina Girl. David Hoang of Clarksburg, MD: 3 Shark releases and 31 lb. King Mackerel on Carolina Girl.